Science fiction satire isn’t a new phenomena. 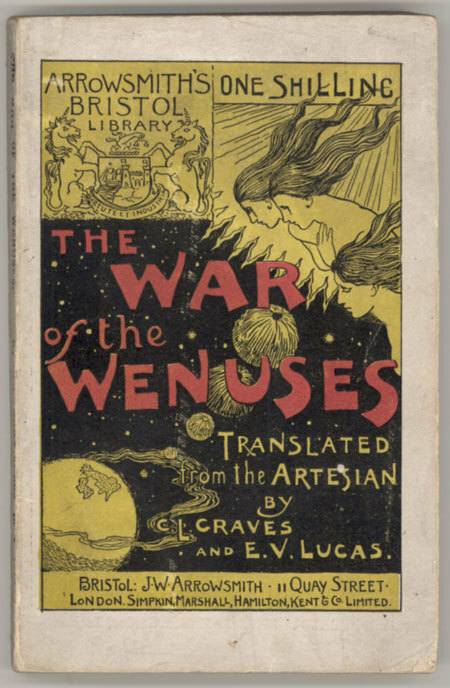 The War of the Wenuses by Charles L. Graves and Edward V. Lucas is a parody of H.G. Wells’ The War of the Worlds published in 1898. The story chronicles an invasion by gorgeous Venusian women who devastate Earthlings with just a gaze. If you indulge in this form of nostalgic humor, you don’t have to shell out the big bucks for this First Edition, but can read the book online on the wonderful Gutenberg site. This entry was posted in Books, Europe, History, Uncategorized, Writing and tagged Fiction, H.G. Wells, Satire, Science Fiction and Fantasy. Bookmark the permalink. Unfortunately, all IP addresses here in Germany are blocked from the Gutenberg website at present. Why is the site blocked? I was recently informed that I can no longer sell books to customers in Germany because I lack a German tax account. While this new regulation may protect some businesses from international competition, it penalizes small businesses while doing nothing to stop the Amazon steamroller.